First, let me explain the three tiers that I broke this guide into due to the liquor laws. The distinctions are brewpubs, breweries, and craft beer pubs which all have different licenses. The brewpubs have breweries on the premise but also offer a full kitchen and menu for customers. These are what you would generally find at most breweries in the United States – a place where you can sit at the bar or at your own table, pay for tasters or pints, and enjoy a meal if you’re hungry. In this guide, those types of craft beer establishments would include Canoe, Swans, Spinnaker’s, and Moon Under Water. Those that are considered the breweries in town are not technically allowed to sell beer on the premise where they brew due to their license. Owners & brewers decide to do this for a number of reasons. 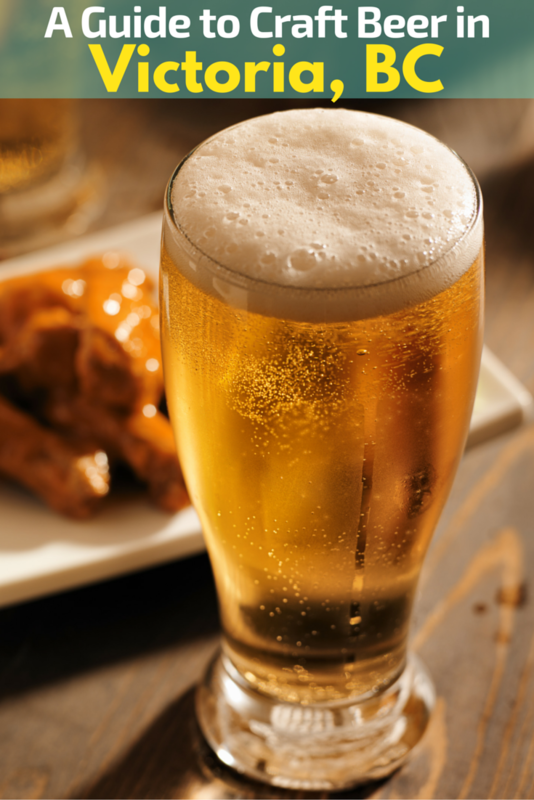 Partially the reason lies in how steep the cost can be for the license to sell alcohol on site, other times brewers simply like to only focus on the beer and don’t want the food aspect that’s necessary to sell beer on location in Victoria. Thus, you can go fill up and pay for growlers to take away, but you cannot purchase tasters to drink at Victoria breweries. With that said, all of the breweries that I went to offered me free samples (sometimes of their whole selection), to get around this and I was still able to try their beer. I made sure to leave a decent tip for this, even though they weren’t allowed to charge me for the beer. In addition, because these Victoria, BC breweries don’t really have tasting rooms, there are usually no places to sit and the area where you can try the beer or fill up growlers is generally very small. The locations on this list that are considered breweries would be Vancouver Island, Phillips, Hoyne, and Driftwood. 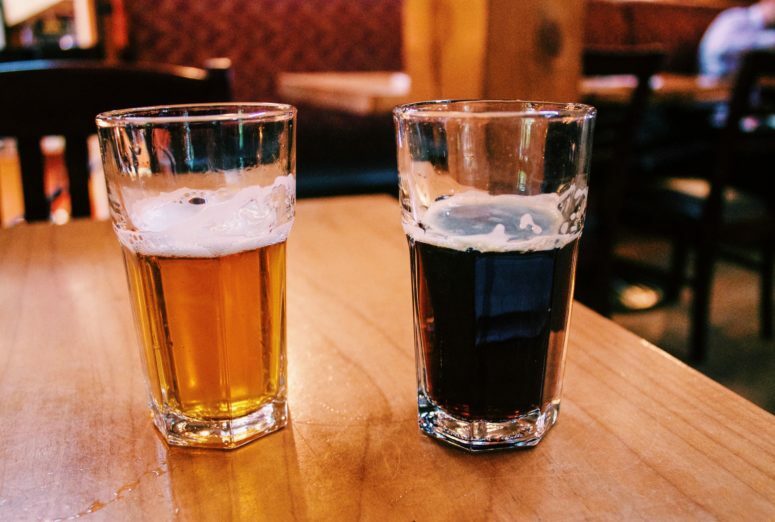 Lastly, the craft beer pubs are the standard bars that you would eat and drink in, and offer a good variety of different types of beer, usually both Canadian and internationally. These would include The Drake Eatery, Bard & Banker, and Garrick’s Head Pub on the list. Hopefully, that clears things up a bit before I go into the specific places to visit for craft beer in Victoria, it’s nice to be in the know when you’re exploring the local craft beer scene in a new place! And finally, it’s good to keep in mind that beer is fairly expensive in BC as a whole so be prepared to budget for brewery hopping accordingly. There is a large tax that is put on alcohol and I never paid below $7 for a pint, sometimes paying up to $10 or more depending on the place and style of the beer. Without further ado, my guide to Victoria breweries! Canoe Brewpub was the first of the many Victoria brewpubs that I stopped at. I discovered it while walking around the Chinatown area, looking for brewpubs nearby for dinner. The location, right on the harbor, was a beautiful spot to walk to right before sunset. The pub was tucked away on a quiet side street, and the whole area exuded relaxation. Canoe was also the first time I saw Canadian friendliness spring into action. My server was accommodating and was nice enough to give me a quick little tour of the brewery after I told him I was on a mission to try all of the best breweries in Victoria, BC. The brewpub itself represented a type of casual elegance. There were chandeliers and multi-levels of seating that created a communal yet custom atmosphere. The food went well with the atmosphere. 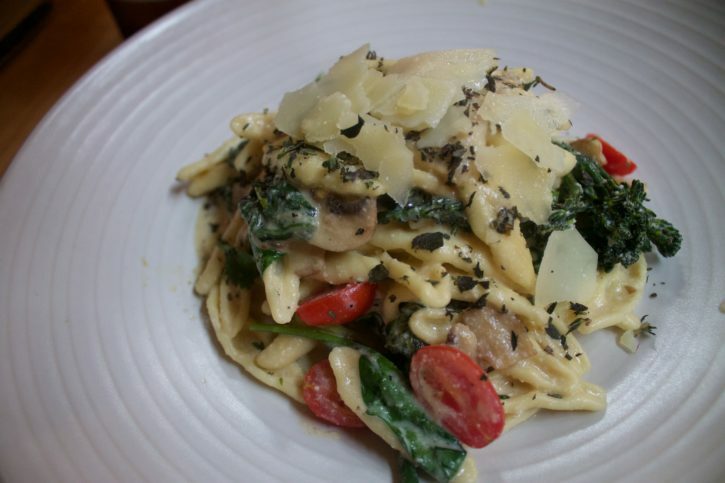 I had the creamy and fresh vegetarian pasta dish and it paired nicely with the pale ale. My server brought me free tasters of a few other Victoria beer as well and I’d have to say my favorite overall was the dark ale. Fun fact, they brew all of their beer according to the Bavarian Purity Order of 1516 – beer nerds unite! From the branding to the names of the beers, and the ambiance of the actual brewpub, Canoe came off as clean, crisp, and comforting. The perfect place for a nice dinner by yourself or with friends. Practical info: 450 Swift Street; Sunday to Wednesday 11:30 am – 11 pm, Thursday to Saturday 11:30 am – 12 am. 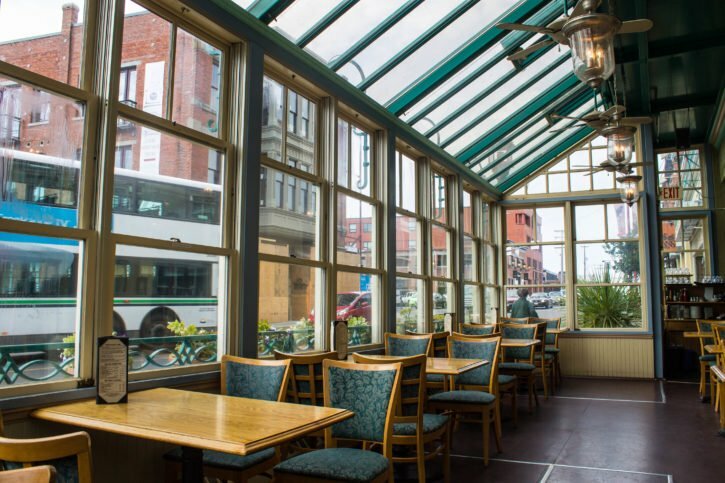 When I walked down the street and saw the sunny glass patio with fresh flowers at Swans Brewpub, I knew it was a place I wanted to have an afternoon Victoria beer – especially with the nice weather I had while I was in Victoria. I also tried my first official Canadian poutine at Swans, so it will probably always have a special place in my heart. With that said, I tried their Arctic Kolsch and found it to be refreshing but not amazing, and the service just okay. I think my waitress was itching to get off and seemed distracted while serving me, but I can completely understand that feeling as well, having been a bartender for quite a few years. Swans reminded me of an old British pub, and the fact that they have live music every night with no cover charge only added to that feeling. 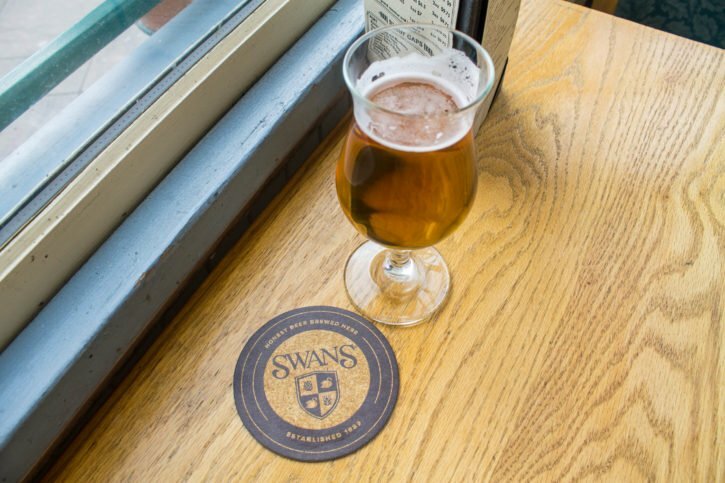 Swans was started in 1989 in Victoria, making it one of the older breweries in Victoria, BC. They specialize in British and German style ales, even going so far as to import malts and strains of yeast from the UK. They’re also very au naturel – they don’t use any syrups or sugars in their beer, only grain mashes, and they leave it unfiltered. Practical info: 506 Pandora Avenue; Monday to Friday 11 am – 1 am, Saturday 9 am – 1 am, Sunday 9 am – midnight. Spinnaker’s Gastro Brewpub is the second oldest of the Victoria brewpubs and arguably the most popular and famous brewpub in the city. The brewpub offers slightly more upscale dining (similar to Canoe), using farm to table ingredients for their dishes and focusing on fresh and hearty menu items. Spinnaker’s is also a guesthouse, so if you fancy Victorian-style rooms, whirlpool tubs, fireplaces, and hardwood floors try and book accommodation here for a night or two. Furthermore, the brewpub & hotel are located right next to a beautiful walkway that takes you back to the downtown area and is a stunning place to be at sunset. There is a lot of British influence in general at pubs and breweries in Victoria, but you can definitely see it at Spinnaker’s, a craft beer haven housed in a Victorian house from 1884. They also have a ton of beer options to choose from, whether your palate is after more traditional styles or the barrel-aged sour variety. Because it is a larger brewery in Victoria, I found the actual atmosphere and service to be less personable than a lot of the other places I visited. I thought the food was tasty, although a little overpriced for the portion size (I ordered one of their pizzas). From the locals that I talked to, a lot claimed that Spinnaker’s had lost their finesse with food in recent years, but perhaps you just have to order the right items on the menu. With that said, you have to at least visit Spinnakers’s for a beer while you’re in town, they’re considered the pioneers of the craft beer industry in Canada, having been around since 1984. If you stop in, make sure to try one of their barrel-aged sours – my favorite! Practical info: 308 Catherine Street; Monday to Sunday 8 am – 11 pm. I just think of a sociable fun atmosphere when I think back to Moon Under Water Brewery. 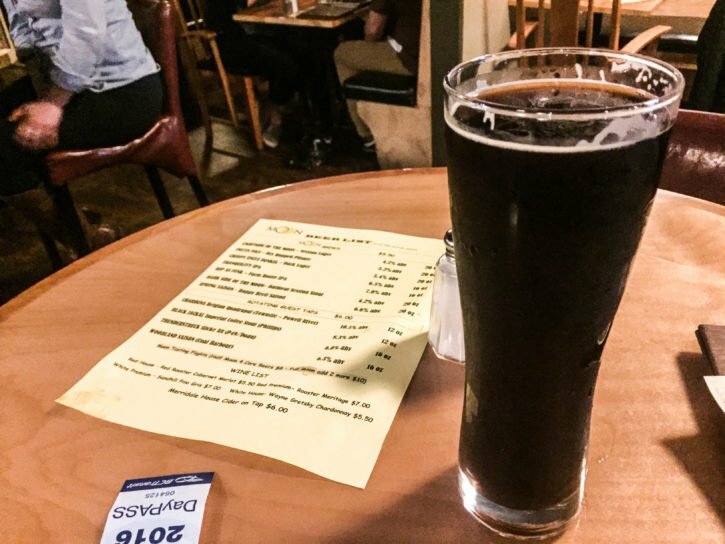 During my DIY Victoria craft beer tour, I happened to walk into Moon Under Water during their music bingo night, managed to find the only available table for myself, and continued to people watch while sipping on the Creepy Uncle Dunkle (great name!). I didn’t get to talk to the bartenders or servers very much because it was loud when I walked in, but they were all friendly, quick, and helpful with my beer selection. Moon Under Water (as well as Driftwood) had some of my favorite quality brews, and they specialize in German lagers, wheat, and sour beers. I didn’t get to try any of their food while I was there, but I heard it’s quite delicious and the menu seemed to be affordably priced. There are deals or events on most nights of the week as well. 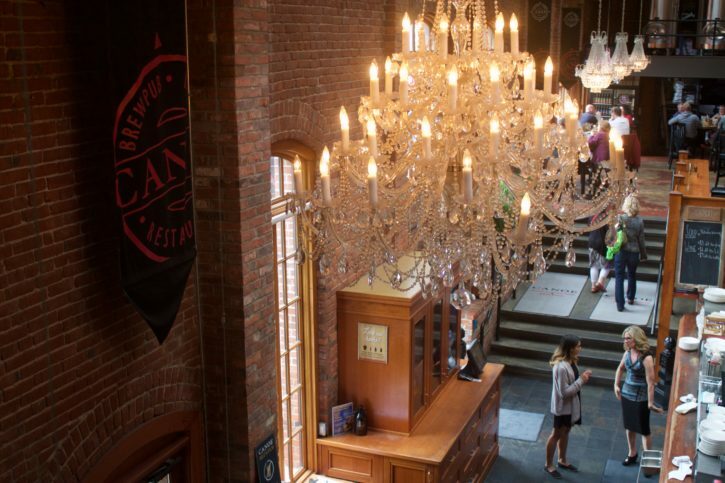 The brewery itself is located in what is considered the brewery district of Victoria, so it’s a great place to stop in at if you want to try out a few different breweries for an afternoon. They also offer brewery tours if you’d like to get more of a behind-the-scenes type of experience. Practical info: 332 Beach Drive; Sunday to Thursday 11am – 11pm, Friday & Saturday 11am – 12am. Vancouver Island Brewing Co. is the oldest brewery in Victoria and on Vancouver Island, having just celebrated their 30th year anniversary. Out of all the actual breweries (not brewpubs), this one had the most space for taste testing their beers. I tried a good handful of their brews and found them to be pretty standard but refreshing. If you’re new to craft beer and not looking for anything too crazy, I would recommend you enjoy one of their Victoria brewery tours. Their space is huge for those wanting to come taste beers with a large group or wanting to rent out a space for a party. 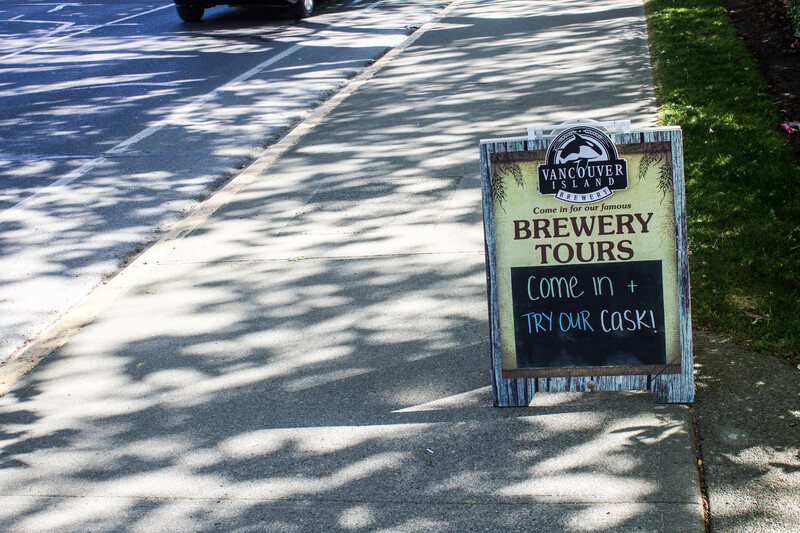 Vancouver Island Brewing Co. also offers brewery tours Friday and Saturday at 1 pm & 3 pm. They pride themselves on clean, fresh, and natural beers that reflect the coast that they live on. Some of my favorites of theirs included the Sea Dog Amber Ale and Hermann’s Dark Ale. Practical info: 2330 Government Street; Monday to Saturday 10 am – 6 pm. Phillips is the most popular of all the Victoria breweries on the island, their Pilsner was the beer I saw EVERYWHERE while I was in town. They’re also known for having the most “hipster” attitude in terms of their staff, a little too cool for school and pretentious compared to the rest of the craft breweries in Victoria. I did see a little bit of that attitude during my visit, but nowhere near as bad as what you would get in some parts of the Pacific Northwest in the States. I have to be honest and say that although I did enjoy their beer, they didn’t stand out for me in my Victoria, BC brewery tour. Again, similar to Vancouver Island, I found their beers to be more on the entry-level side, although perhaps a little more creative than what I found at Vancouver Island Brewing Co. This is the beer you’d buy a six-pack of to bring to a dinner party, usually you can’t go wrong with a pack of Phillips is what I came away with. If you’re looking to have a classic experience in the Victoria craft beer scene, this place would be it. Practical info: 2010 Government Street; Monday 10am – 5pm, Tuesday & Wednesday 10am – 6pm, Thursday & Saturday 10am – 6:30pm, Friday 10am – 7pm, Sunday 11am – 6pm. I didn’t spend a whole lot of time at Hoyne Brewing, I only stayed for a few small tasters, but I enjoyed how friendly the staff were here and the unique beers I tasted. 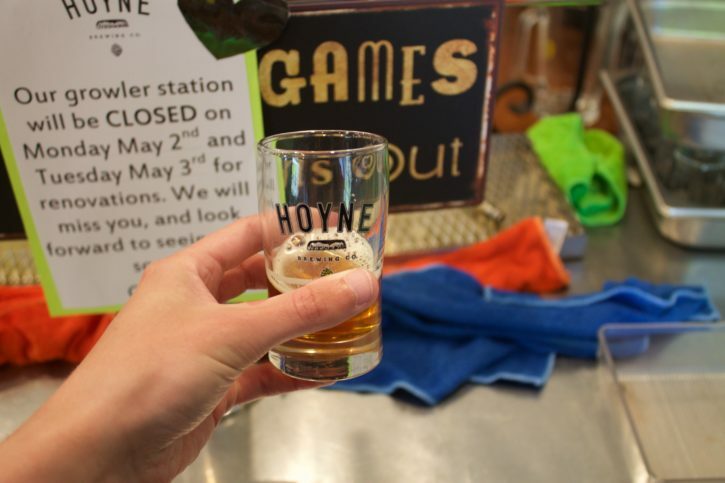 Hoyne is thought of as one of the craftiest and highest quality breweries in Victoria, BC, and there really wasn’t a beer I didn’t like in my small free flight of tasters. When you learn the history behind this brewery you’ll understand why the beer is so good. The brewer & owner, Sean Hoyne, helped set-up not one, but two popular brewpubs in town – Swans in 1989 and Canoe in 1998. You could say he has made quite the name for himself in town with his signature and ever-expanding craft. Try the Helios Dortmunder Golden Lager, Off the Grid Vienna Lager, and the Down Easy Pale Ale when you stop in. Practical info: 101-2740 Bridge Street; Monday to Friday 12 pm – 6 pm, Saturday 11 am – 6 pm, closed Sundays. 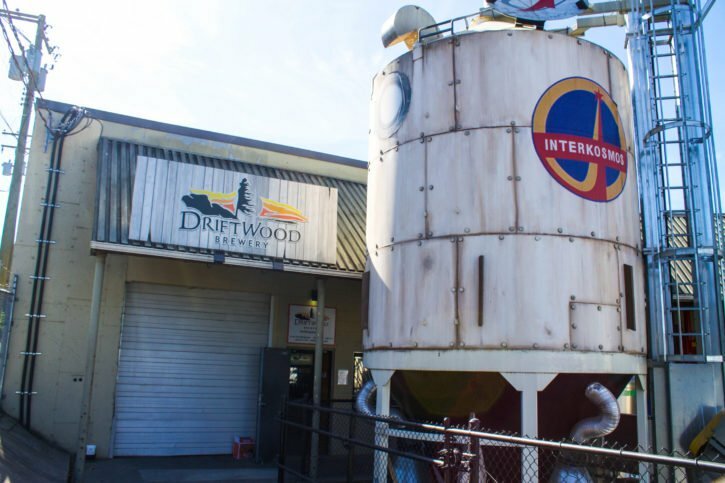 Driftwood Brewery, the last brewery on my list of Victoria breweries, was one of my all-time favorites if only for the outgoing and friendly staff I met in the “non-tasting room.” Tomo and Alex were working the day I went in and they were the epitome of Canadian genuineness. Tomo walked me through every single one of their beers, in fact, he insisted I had to try them all! You could tell that the staff were passionate about the beer at Driftwood and were also very knowledgeable about what they were serving which is always a good sign. Their goal, as they say on their website, is to create a unique profile in each beer they brew and that came through tenfold in what I tasted. Every beer that I tried was unique and wonderfully delicious in its own right. And not to judge a book by its cover, but I adored their branding and graphics too. Fat Tug is their all-time most popular beer, but I really enjoyed their Black Stone porter and Crooked Coast altbier as well. Practical info: 102 – 450 Hillside Avenue; Tuesday to Saturday 11am – 6pm, closed on Sundays & Mondays. And if you’re looking for a great place to simply chill out and have multiple choices for types of beer and breweries, I would recommend the following places. These have history, a great ambiance, and plenty of choices for your pallet. With all things considered, I was impressed with the craft beer culture I found in Victoria and thoroughly enjoyed my time checking out the many breweries in town. The beer scene was a nice mix of North American and European (especially British and German) influences with a touch of charm and Canadian friendliness thrown in. It was also nice to take a break from the massive hop profiles of the Pacific Northwest, and enjoy brews that were more on the smoother than bitter side of the spectrum. Driftwood and Canoe were my favorite spots for atmosphere, friendliness, and quality beer. The Fairmont Empress Hotel is located right on Victoria’s Inn Harbor and gives its guests stunning views. This luxurious hotel has on-site restaurants, a full spa, fitness center, indoor pool, hot tub, and sauna. 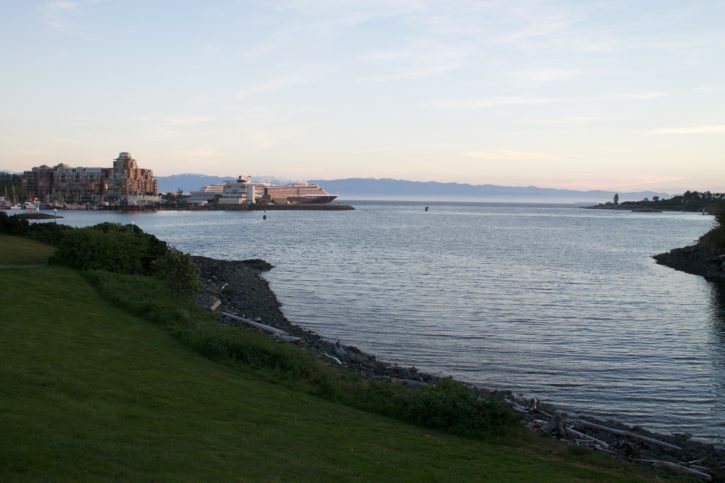 The Fairmont is located close to some popular Victoria attractions such as the Royal London Wax Museum and The Royal British Columbia Museum. Spinnaker’s Gastro Brewpub is a great location to stay at in Victoria. It is close to the city center and, as I mentioned above, it is home to a brewery and pub. It features a spa bath and free WiFi. Guest can enjoy the comfort and elegant rooms offered at the hotel. HI-Victoria is a hostel that is perfect for anyone who is looking for clean budget-friendly accommodations. This hostel is located in Downtown Victoria and features WiFi and billiards. Guest will be close to Save-On-Foods Memorial Centre, Pacific Rim College and Maritime Museum of British Columbia. If you have any questions you can ask the friendly staff. Have you been to any breweries in Victoria, BC? Do you have an all-time favorite brewery? Buy your BC Travel Guide here. 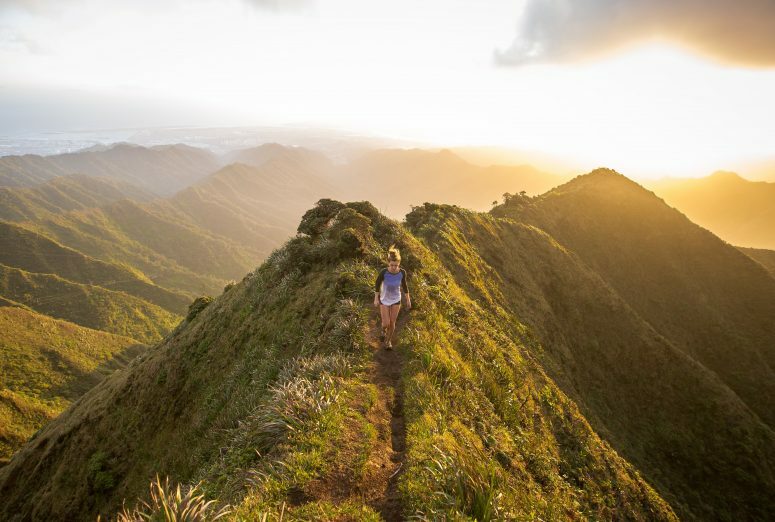 Check out these blog posts for more ideas on what to do on your next trip to British Columbia! Whenever I think about craft beer it always seems to make my mouth water for some reason, ha. It’s funny because I don’t even really like beer but the dark, rich color looks so good. It’s something I’m interested in getting into. Looks like it would be tasty. 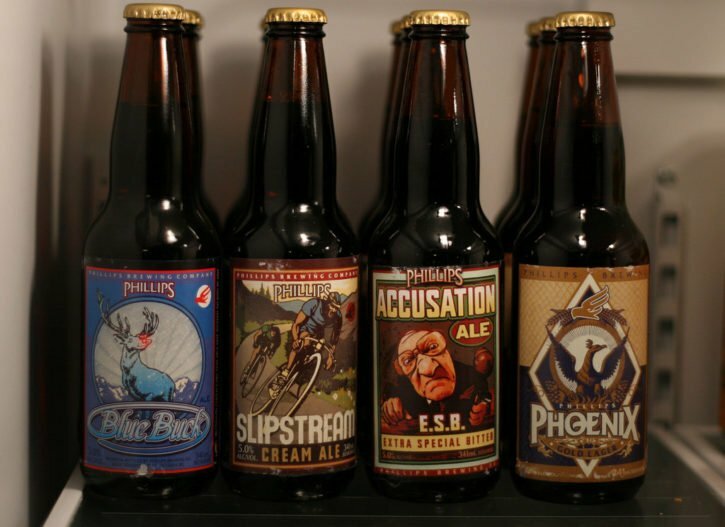 The first Craft Beer Tasting Tour by Bike in Canada is right here in Victoria! 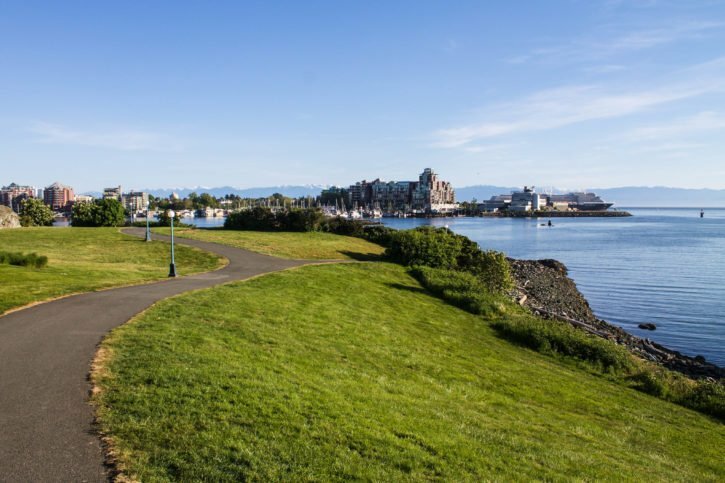 The tour is called the “Hoppy Hour” guided bicycle tour and it is a beautiful and easy bike ride with 3 different stops and includes a light snack. Check out The Pedaler Bicycle Tours and Rentals (thepedaler.ca) for a fun afternoon of pedaling around town to sample local, delicious, craft beer. Rosemary, that sounds so good! I love bike tours & trying local craft beers when I travel, I’ll have to check out the Hoppy Hour next time I’m in Victoria. Thanks for the recommendation. Thanks Adaleta! Craft beer is great and it’s interesting trying different styles and ways of brewing in new countries. Haha, Canada is very hard to resit traveling to! I was only planning on visiting the country once this year, and I’ll have visited it 3x in the last 2 months by next week. Awesome, glad you liked it Erica! I will have to get my husband to read this post them perhaps he will set sail to Victoria spurred on by thought of delicious beer. Cheers.